Use the label 'Football' and you find a lot of posts related to an experiment: finding a correspondence between charts and results in football. Here is another try. On Monday June 23, 2014 there is the match Netherlands-Chili and I think that it will be undecided but a typical short fuse match. Why? 5. Double Sun-Mars synastry between the coaches. This shows competition. But, nothing is certain and predicting is difficult, especially when it is about the future:). So don't put your money on it, just study the charts. Any other idea? Let me know before the match! This is the chart of the final moment with the transit positions on the day of birth of Sampaoli. 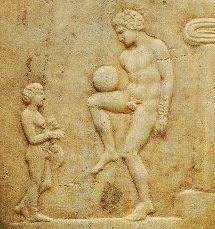 The picture above shows that in Greece in ancient times there was football, too, just like astrology. Did these two meet? Boy, 2-0 is a real dissappointment for Sampaoli. I should have trusted Neptune-MC as a strong indication of losing the match! Astrology is ancient science. It is best way to get success in life easily. People should consult to best astrology specialist for any type problems solution.